Don Lincoln is a senior scientist at the U.S. Department of Energy's Fermilab, America's largest Large Hadron Collider research institution. He also writes about science for the public, including his recent "The Large Hadron Collider: The Extraordinary Story of the Higgs Boson and Other Things That Will Blow Your Mind" (Johns Hopkins University Press, 2014). You can follow him on Facebook. Lincoln contributed this article to Live Science's Expert Voices: Op-Ed & Insights. Many science-savvy people take it for granted that the universe is made not only of Carl Sagan's oft-quoted "billions and billions" of galaxies, but also a vast amount of an invisible substance called dark matter. This odd matter is thought to be a new kind of subatomic particle that doesn't interact via electromagnetism, nor the strong and weak nuclear forces. Dark matter is also supposed to be five times more prevalent in the universe than the ordinary matter of atoms. However, the reality is that dark matter's existence has not yet been proved. Dark matter is still a hypothesis, albeit a rather well-supported one. Any scientific theory has to make predictions, and if it's right, then the measurements you do should line up with the predictions. The same goes for dark matter. For instance, dark matter theories make predictions for how fast galaxies are rotating. But, until now, measurements made of the detailed dark matter distribution at the center of low mass galaxies didn't line up with those predictions. A recent calculation has changed that. The calculation helps resolve the conundrum of the Tully-Fisher relation, which compares the visible, or ordinary, matter of a galaxy to its rotational velocity. In very simplified terms, scientists have found that the more massive (and therefore brighter) a spiral galaxy is, the faster it spins. The first inklings that there might be a need for something like dark matter go back to 1932. Dutch astronomer Jan Oort measured the orbital speeds of stars within the Milky Way and found they moved too quickly to be explained by the observed mass of the galaxy. 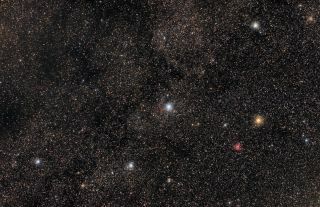 Vera Rubin and Kent Ford found that stars at the edges of galaxies, such as the Andromeda galaxy (shown here), were traveling faster than expected. Dark matter could help to explain these galactic rotation discrepancies. However, the search for dark matter began in earnest nearly a half-century later when, in the late 1970s, astronomer Vera Rubin and instrument-maker Kent Ford measured the rotation rates of nearby galaxies as a function of the galaxy's stars' distances from the center. They compared the measurements with predictions from standard Newtonian gravity theory. Stars orbit their parent galaxy in nearly circular paths and gravity is the force that holds the stars in those orbits. Newton's equations predict that the force that makes the stars move in a circular path, F(circular), should equal the force due to gravity on the star, F(gravity), or else the star would fly off into space or fall in to the center of the galaxy. For those who remember high school physics, F(circular) is a statement of inertia and is just Newton's F = ma. F(gravity) is Newton's law of universal gravitation. Such a dramatic discrepancy needs explanation. Near the center of galaxies, Rubin and Ford's measurements meant the theory was working, while the discrepancy at larger orbital distances meant something was going on that existing theories couldn't explain. Their insights revealed that either we don't understand how inertia works (e.g., F(circular)), or we don't understand how gravity works (e.g., F(gravity)). A third possibility is that the equal sign is wrong, meaning that there is some other force or effect that the equation doesn't include. Those were the only possibilities. In the 40 years since Rubin and Ford's original work, scientists have tested many theories to try to explain the galactic rotation discrepancies they found. Physicist Mordehai Milgrom proposed a modification of inertia, called "modified Newtonian dynamics," or MOND. In its initial form, it postulated that at very low accelerations, Newton's equation F = ma didn't work. Then there are predictions that new forces exist. These ideas are clumped together under the name "the fifth force," implying a force beyond gravity, electromagnetism and the strong and weak nuclear forces. Finally, there is the theory of dark matter: That a type of matter that doesn't interact with light at all, yet exerts a gravitational pull, permeates the universe. Were the galactic rotation measurements the only data we have, it might be hard to select between these different theories. After all, it might be possible to tweak each theory to solve the galactic rotation problem. But there are now many observations of many different phenomena that can help identify the most plausible theory. One is the speed of galaxies within large clusters of galaxies. The galaxies are moving too quickly for the clusters to stay bound together. Another observation is of light from very distant galaxies. Observations of these very distant ancient galaxies show that their light is distorted by passing through the gravitational fields of more nearby clusters of galaxies. There are also studies of small non-uniformities of the cosmic microwave background that is the birth-cry of the universe. All of these measurements (and many more) must also be addressed by any new theory to explain galactic rotation speeds. Dark matter theory has done a reasonable job at predicting many of these measurements, which is why it is well-respected in the scientific community. But dark matter is still an unconfirmed model. All evidence of its existence so far is indirect. If dark matter exists, we should be able to directly observe interactions of dark matter as it passes through the Earth and we might be able to make dark matter in large particle accelerators, like the Large Hadron Collider. And yet neither approach has been successful. In addition, dark matter should agree with all, not just many, astronomical observations. While dark matter is the most successful model so far, it is not completely successful. Dark matter models predict more dwarf satellite galaxies surrounding big galaxies like the Milky Way than are actually detected. Although more dwarf galaxies are being found, there are still too few compared to dark matter's predictions. Another big, open question is how dark matter affects the relationship between the brightness of galaxies and their rotational speeds. This relationship, which was first presented in 1977, is called the Tully-Fisher relation, and it has shown numerous times that a galaxy's visible mass correlates well with its rotational speed. So, that ends the back story. What is new? The Tully-Fisher relation is a tough challenge for dark matter models. The rotation of a galaxy is governed by the total amount of matter it contains. If dark matter truly exists, then the total amount of matter is the sum of both ordinary and dark matter. But existing dark matter theory predicts that any random galaxy may contain larger or smaller fractions of dark matter. So, when one measures the visible mass, you could potentially be missing a huge chunk of the total mass. As a result, visible mass should be a very poor predictor of the total mass (and thereby rotational speed) of the galaxy. The galaxy's mass could be similar to that of the visible (ordinary) mass or it could be much larger. Thus, there is no reason to expect that the visible mass should be a good predictor of the rotational speed of the galaxy. Yet it is. In fact, in a paper released this year, dark matter skeptics used measurements of the Tully-Fisher relationship for a variety of galaxies to argue against the dark matter hypothesis and for a modified version of inertia, such as MOND. However, in a paper released in June, scientists have given dark matter models a significant boost. Not only does the new work reproduce the successes of earlier predictions of the dark matter model, it also reproduces the Tully-Fisher relation. The new paper is a "semi-analytic" model, which means that it is a combination of analytic equations and simulation. It simulates the clumping of dark matter in the early universe that may have seeded galaxy formation but also includes the interaction of ordinary matter, including such things as the infall of ordinary matter into another celestial body due to its gravitational pull, star formation and the heating of infalling gas by starlight and supernovas. By carefully tuning the parameters, the researchers were better able to match the predicted Tully-Fisher relationship. The calculation's key is that the predicted rotational velocity includes a realistic value for the ratio of baryons to dark matter in the galaxy. The new calculation is an important additional step in validating the dark matter model. However, it is not the final word. Any successful theory should agree with all measurements. Failure to agree means that either the theory or the data is wrong, or at least incomplete. A few discrepancies between prediction and measurement still remain (such as the number of small satellite galaxies around big ones), but this new paper gives us confidence that future work will resolve these remaining discrepancies. Dark matter remains a powerfully predictive theory for the structure of the universe. It is not complete and it needs validation by discovering the actual dark matter particle. So, there is still work still to do. But this most recent calculation is an important step toward the day where we will know once and for all if the universe really is dominated by the dark side.